Let’s face it ladies. The summer heat can wreak havoc on your look. But take heart, because when the heat and humidity turn up, you can sizzle too! Whether you’re at work or at play, there’s no better feeling than self-confidence. It’s not a question of vanity, but rather a journey toward self-fulfillment and overall well-being. For many people, the idea of cosmetic surgery evokes thoughts of a facelift, breast enhancement or tummy tuck, just to name a few. While these are great options for those contemplating a surgical makeover, there are also lots of easy, in-office treatments that can have you glowing in time for summer. Let’s check them out! Finally, there is a safe and effective non-invasive procedure that permanently destroys stubborn fat. UltraShape® Power is the first and only FDA-approved procedure to use focused, pulsed ultrasound energy to selectively destroy fat cells and eliminate them naturally. Other non-surgical fat reduction procedures heat or freeze fat, which can damage the surrounding skin, nerves and blood vessels. UltraShape® Power, on the other hand, erases fat quickly using safe ultrasound without the damaging side effects. This comfortable, in-office treatment helps you slim down without the downtime. As few as three treatments can result in about 32 percent fat destruction. The results we are seeing from these treatments are undeniable. You can literally have an UltraShape® Power treatment in the morning and wear your swimsuit that afternoon with zero downtime. With the summer heat comes sweat and the dreaded makeup melt. You don’t have to put up with makeup that settles into the fine lines of your face. Botox® has become one of the most popular cosmetic procedures for good reason. As one of the safest drugs on the market, patients see incredible improvements in the look of forehead lines, crow’s feet, lip lines and frown lines. Your friends and family will ask if you’ve been on vacation, because you look so relaxed. Another powerful tool includes a group of products called fillers. These are products that can mask all sorts of bothersome issues, such as bags and dark circles under your eyes and smile lines that form parentheses around your mouth. Fillers can even restore volume to your cheeks, lips and chin. Fillers are instant, and it doesn’t get much better than that! Summer weddings and parties are popular, and with no downtime, HydraFacial MD is the perfect primer right before an event. It is clinically formulated to improve fine lines, skin texture, hyperpigmentation and even acne. This relaxing treatment provides immediate, visible results. Its unique swirling motion infuses your skin with luxurious, conditioning serums to give you that fresh-faced, dewy look you always see on the red carpet. This is one of the newer options to add some luster to your look, and once you try it, it will be your new best friend. Also known as collagen induction therapy, microneedling works by creating microscopic channels in the skin. The body then responds by healing itself and, in the process, youthful collagen and brand-new skin is produced. This option is great for improving skin texture, softening scars and stretch marks and reducing the appearance of large pores. Who has time to shave or deal with ingrown hairs and skin irritation? 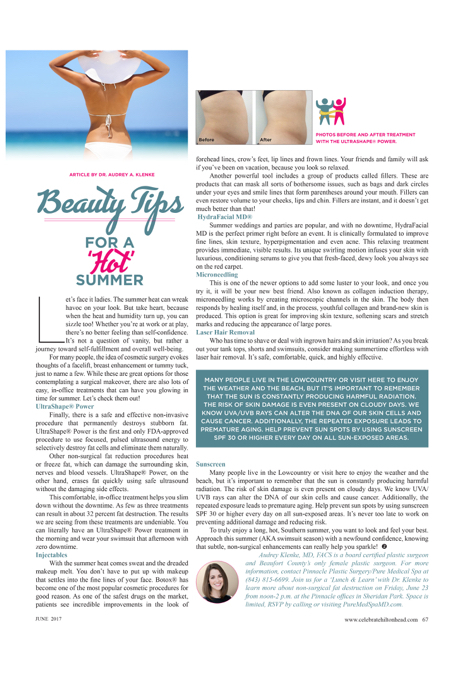 As you break out your tank tops, shorts and swimsuits, consider making summertime effortless with laser hair removal. It’s safe, comfortable, quick, and highly effective. Many people live in the Lowcountry or visit here to enjoy the weather and the beach, but it’s important to remember that the sun is constantly producing harmful radiation. The risk of skin damage is even present on cloudy days. We know UVA/UVB rays can alter the DNA of our skin cells and cause cancer. Additionally, the repeated exposure leads to premature aging. Help prevent sun spots by using sunscreen SPF 30 or higher every day on all sun-exposed areas. It’s never too late to work on preventing additional damage and reducing risk. Audrey Klenke, MD, FACS is a board certified plastic surgeon and Beaufort County’s only female plastic surgeon. For more information, contact Pinnacle Plastic Surgery/Pure Medical Spa at (843) 815-6699. Join us for a ‘Lunch & Learn’ with Dr. Klenke to learn more about non-surgical fat destruction on Friday, June 23 from noon-2 p.m. at the Pinnacle offices in Sheridan Park. Space is limited, RSVP by calling or visiting PureMedSpaMD.com.